This is a wonderful romantic drama that I feel is sadly overlooked. It’s a film that has been lost by this generation of film lovers, thankfully the company Twilight Time has resurrected this awesome film. I for one love this movie. It’s based on the novel by Lynne Reid Banks and was adapted for the screen by the director of the film. I think this film showcases amazing acting. Wonderful chemistry between the actors and actresses. It’s a solid film of dramatic means that showcase how to make a memorable film. Starring the beautiful and amazing Leslie Caron. She was a true goddess of film. Her stunning beauty along side her amazing acting showcased perfection in film. The L-Shaped Room is no different for she shines in total perfection. She has starred in some of the greats in films. From one of her defining roles as Gigi in1958’s Gigi. To her character of Lili Daurier in the 1953 film Lili. She starred in over 70 performances from film and TV. Still acting today as of recently in 2017 in the TV series The Durrells in Corfu. The movie is about a 27-year-old French woman named Jane. She has moved in to a boarding house in Notting Hill London. 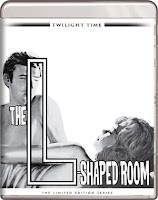 The room hints the title of the film is an L-Shaped Room. She has many interactions with many different styles of characters. She soon meets the character of Toby and they end up having a romantic relationship. To make matters more dramatic is Jane is pregnant and refuses to marry the father. Also starring the amazing Tom Bell as the character of Toby. He was a pure English actor that was a truly gifted performer in all that he did. He was one of those actors that owned his roles and made you as the viewer enjoy or become apart of that character he played. In his later years he played in one of my all time favorite TV series. The amazing masterpiece TV show Prime Suspect. He played the character of Sgt. Bill Otley. He always maintained a perfection in his roles. I miss him greatly. He died in 2006 and I feel it was a total devastating lose to the world of cinema. Throughout his long career he acted in over 100 features of film and TV. He was a one of a kind and is greatly missed by me. His performance in The L-Shaped Room is flawless. This is directed by a multi-talented individual. He not only directed films, but he was a writer of films and an actor in films. Starring in such films as 1961’s action epic The Guns of Navarone. He not only wrote 1967’s The Whisperers he also starred in it and directed it. He acted in over 42 films and TV shows. He wrote over 30 films and TV shows. He directed 20 films, TV shows and documentary’s. From 1965’s King Rat, 66’s The Wrong Box, 68’s Deadfall and others. 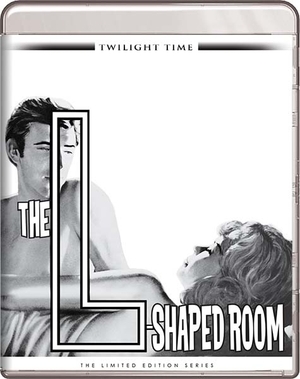 He was a solid director and The L-Shaped room is a prime example of his directing ability. Once again, a mastery of perfection that only Twilight Time can do. Crisp imagery and sound quality is perfection to the ears. This film has never looked or sounded any better. Isolated Music & Effects Track: This was a fantastic listen by itself for the fact of who is behind it, John Barry Pendergast. A master talented composer, conductor and musician of film. He has worked and created some of the greatest film scores such as the brilliant masterpiece Midnight Cowboy, Dances with Wolves, and might I add was the original person to arrange and perform the iconic James Bond theme, on the very first James Bond film, Dr. No. He through the span of his life won many awards, but also most importantly won 5 Academy Awards for his excellence in film scores. Of those five, two of those Oscars where for Born Free which has also been released as a Special Edition Twilight Time Blu-ray, which you can read my review in the Twilight Time section of this blog. He also did the music for another Twilight Time Special Edition release The Chase. He brings the music behind the films into a beauty of their own. Twilight Time did an amazing job honoring this master on this special feature. Audio Commentary with Film Historians Lem Dobbs, Julie Kirgo, and Nick Redman. A wonderful listen by three amazing film historians. The price of the Blu-ray is worth it just for this commentary. Having Julie Kirgo and Nick Redman and Lem Dobbs together talking about a solid film is truly an amazing gift for the lover of all things cinema. Highly recommend. I don’t say that lightly. This is a perfect Blu-ray to experience. A solid film with dynamic, flawless acting. This is a must own, must experience Special Edition Blu-ray. Twilight Time did another amazing job. High class and high quality Audio and Video restoration. A perfected imagery and sound.